I would classify this narrative as an addition to the archive of observations regarding root disease, particularly summer patch, on Kentucky bluegrass. The rapid decline of turf in individual patches (Fig. 1) began in mid-August. However, back in May, they appeared as subtle circular areas of thin, slow growing grass. The patches were not as dense as the surrounding turf, and they did not cause any concern to my playing partners, who often must chip onto putting greens after poor approach shots. High daily temperature and tice weekly precipitation during August prevented any turf recovery and hastened the decline to the current condition (Fig. 3). The damage now is more than cosmetic—it is structural and affects play. (My playing partners are offered sympathy, but no relief from their errant shots). After a few days of cool (55 F) nights, the KBG began recolonizing patch centers, resulting in the “frog-eye” pattern (fig. 4). Although the images were captured in 2016, they represent my observations of the summer patch syndrome during similar environmental regimes over the years at the same site. Figure 1. 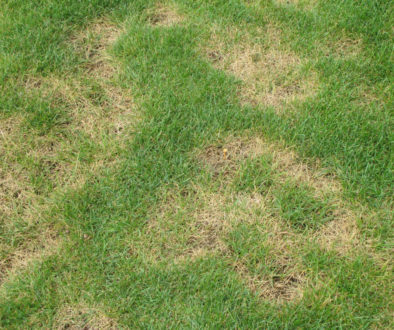 Well-defined circular patches are typical of root diseases, such as summer patch. Figure 2. In early-mid spring, patches are subtle and can go unnoticed. Figure 3. Patches around putting greens are unsightly and impede play. Figure 4. Kentucky bluegrass will recolonize patch centers once environmental conditions favor root growth. The most difficult “fungicide” decisions involve the root diseases on KBG. Fungicides can be effective, but they must be applied in mid-late spring, often before there are any symptoms at all. Given that the pathogens remain in thatch and soil, it is important to understand the disease history of the site before considering a fungicide option. Often, more than one application is required. Valid research on fungicides for root disease control is scarce, but in most reports QoI (strobilurin) and DMI fungicides can be effective. Once the patches and/or rings are in full form, no fungicide will be effective in stopping or reversing the decline. Caution–because fungicides do not move down to the roots through the leaves inside the plant, fungicides must be washed off leaves (into thatch/soil) for any chance of success. Getting the right amount of chemical to the right place at the right time is not easy, and this difficulty further complicates decisions to use fungicides for controlling root diseases. I will have more on fungicides and root diseases next week.